A lot of collectors were confused and disappointed to learn that the AFLAC autographs inserted in 2011 Bowman Draft Baseball weren't serial numbered like years past. The serial numbers were what set the cards apart from those Topps gave directly to the players. To correct this, Topps is now offering collectors free PSA autograph authentication and grading for 2011 Bowman Draft AFLAC Autographs. 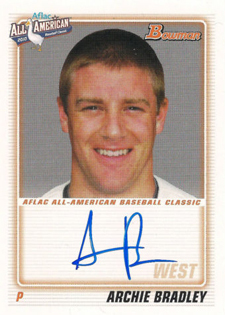 The program is completely free and open only to AFLAC autographs pulled from 2011 Bowman Draft. The players affected are Archie Bradley, Dylan Bundy, Larry Greene, Travis Harrison, Francisco Lindor, Robert Stephenson and Blake Swihart. Grading labels will be phrased in a way that collectors will be able to tell the pack-inserted cards apart from player giveaways sent in for authentication. The offer expires July 1, 2012.